Remember learning the song about a butterfly just born in to the world ? 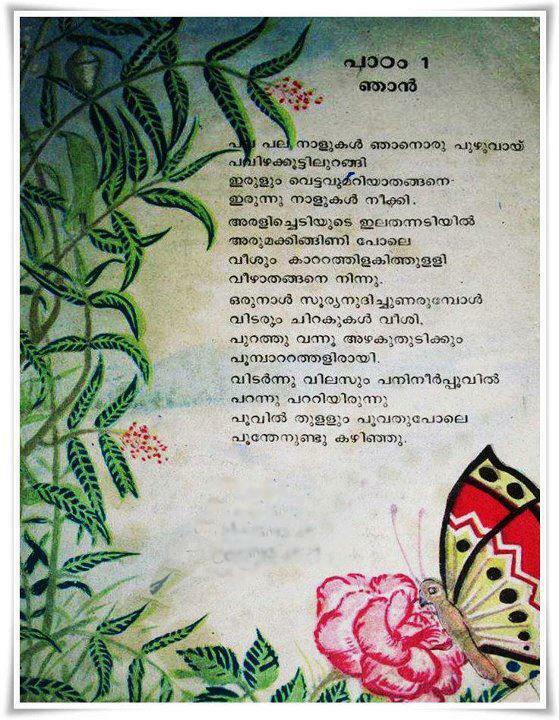 Any one knows which standard Malayalam text book had this song? Fantastc. I thinki I studied this as a malayalam lesson in 3rd standard(1995). Seems like time flies. 18 Years gone! Go ahead. Its nice to remember those old days, even though they will never come back. Yea.. I remember some lessons… “Thinkalum tharangalum(4th standard, 1996)”, “Usmante diary(4th standard, 1996)”, “Vazha(3rd standard, 1995)”, “ഝാന്‍സി റാണി(2nd standard, 1994)”…. Thank you very much Vishnu. If you remember the lyrics, do send it across. hi… plz let me know who wrote this poem. varshangalkkumunpu njan thanichakkiya ente poompaatta enne thedi ethi. athu ente hrudhayathil vannirunnappol manasinu. vallatha oru kulirma initial njan thanichakkilla ithine . Ente vidhyalayam enna pathyam ethravarshangalkkumunkpu padichathanu athinusesham ethra kavithakalim ganangalum ennil minnimaranju ava ormayipolum illa ennittum ithile varikal enteyullil oru vajrakallupol thilangi nilkkunnu. njan ENTE VIDHYALAYAM enna pathyam athyamayi kelkkunnathu ente sahodhari nalam classil padikkumpolanu annu njan onnam classil ayirunnu annu kettupadicha ee padhyam innum manasil mayathe kidakkunnu. nirbhaghyavashal njan nalaam classil ayappolanu DPP pattyar padhathi nillavil vannathu enikku athu clasil padilkan pattiyilla ennalum njan padicha ganangal njan marannu pakshe. ENTE VIDHYALAYAM .njanmarannilla. ente sahodhari chollipadikkumpol ithile eenamayirolkam enne vallathakarshichathu valuthakumthorum ithivarikale njan orupadu snehikka. thudangi. anne ithrayere aakarrlshicha mattoru poem ente jeevithathil undayittilla. i like so much your nosthalgia………. If there are any songs you remember, please share. Thank you very much george for your comments. Can you share the lyrics of the poem that you have mentioned? veendum nanmakal niranja balyam eniku kitiyenkil ennu thonnippoyi edu vayichappol……..
oro kavithayyilum amma chollithanna oru nanmayurangunnundu…..
souhridathinte thanalmaram thanna vidyalayavum………pne avide poompataye pole pari nadanna balyathinte orupadorupadu ormakalu……..kaipidichu nadanna kootukarude kaliyum chiriyum okeyundu…………. the memories of past touches my heart again………. i slipped back to my childhood once again wen i read this……..
if i could get it once again…………. yes the whisperings of that innumerable little virtues……. i cold feel my teachers whisperings of blessing………..
the memories ……..where i was eluding like a butterfly…..
Glad that you liked it. Spread the word! Let us know if you can add stories or songs to the site. hey frnds, does anybody know who wrote this poem? Ee kavitha rachichathu KADAMANITTA RAMAKRISHNAN siraanu…. In 1965, when he was in Madras published first in M Govindan’ s Sameeksha…Source- Kadamanitta Gopinathan Sir ( kadamanitta Foundation, kadamanitta Ramakrishnan Sir’ s own brother)…..
A ntea priyapetta vasukutty masheyum schoolintea mutathea aa plaavumaravum kanji purayum kootty kaly yum varshangal kippuram e ethu cholly yapool orrmavannu orittu kannu nerummmm………….. Feeling very cool and nostalgic. Childhood days means, it was a blessing from God and during that time this song was like a sweet heavenly song, singed by sweet Angles of those time. I studied this song when I was at 3rd standard during 1995. Really i miss those period very much. I know it wont come back but still those movements will be in my heart for ever. thank you very much for sharing these golden memorable lessons… ende makkale ee kadhakalum padhyangalum padippikkanaayi njan shramikkunnu. chilathokke marannathaanu.. ivide comments okke kandappol pala paadangalum paattukalum ormayil vannu.. valare nanni suhruthukkale. Poombatta – ippazhum orkunnu, innum marakkathae varigal..
Usmantae Diary – I still remember the story… The climax – Innum baapayudae aa vakkugal chillitu vachirikkyunnu, usmandae kadayil (sort of)……….. I cannot write anything more because my eyes filled with tears, remembered my school days. Does anybody know the full lyrics of poombata song? Poovil thullum poovathu pole poonthenundu kazhiju. Enikku thonnunnu ingane anennu, am not sure. wooohh aah nalla naalukal…. veendum thirichu vannirunnenkil. Aa mazhayude thanuppum puthiya pusthakathinte manavum ee nimisham ormayilethumbol …aa nalukal ini varillennorkumbol manam thengunnu. Thank you all for the sweet memories.